I know. I’m posting a roast recipe on the Tuesday evening before Thanksgiving. I’m sure everyone already has their menus planned and I’m late to the party. But this roast almost drove me to the brink of madness Call of Cthulu style, so I had to defeat it! And defeat it I did. After about 20 years and twice as many tries I’ve got a fabulous centerpiece stuffed roast that I’m proud to show off to the neighbors. 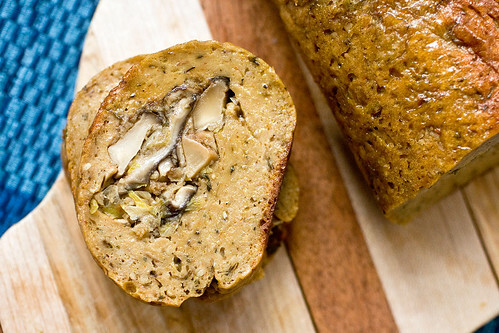 Succulent seitan stuffed with herbed meaty shiitakes and leeks. The seitan is mixed with pureed pinto beans to give it great, juicy texture and even a hint of pink color. It’s really similar to my sausage recipes which I used as a base recipe. The stuffing is coated with bread crumbs, which keep it perfectly packed into the roast when you slice it, instead of falling out all over the place. It all comes together when baked in a familiar tinfoil wrapping. I don’t know what took me so long to get it right. Maybe someday I’ll be ready to talk about it. But right now, let’s get roasting! ~For best results, use a salty homemade vegetable broth. Salt is integral to the flavor of the seitan, so if your broth isn’t seasoned then add a teaspoon or so of salt to it. ~You’ll also want to spoon broth over the roast before serving, to keep it from being dry. Of course you’re going to be coating it in gravy, too. But the broth is a nice touch. If you’re slicing and serving, ladle on spoonfuls of broth on each individual slice, too. You can’t have too much juice, here! ~This roast reheats perfectly. Refrigerate in its wrapper for up to 3 days before hand. When ready to serve, preheat an oven to 350 F and cook for 20 minutes. This will dry it out a bit, so use the broth hints above for sure! ~Use a steak knife for the easiest slicing. ~I used storebought breadcrumbs but if you use homemade, use 3/4 cup. ~This makes enough for 6 hungry people. If it’s not Thanksgiving or another holiday, and people are not totally stuffing their faces, it serves at least 8. Preheat a large pan, preferably cast iron, over medium heat. Saute the mushrooms and leeks in oil until soft, about 10 minutes. Add salt, pepper, garlic and thyme. Cook for about 2 more minutes, stirring often. Sprinkle in the breadcrumbs and toss to coat. Cook the mixture, stirring very often, until the breadcrumbs are toasty and the mixture is relatively dry. This should take about 5 minutes, and the breadcrumbs should turn a few shades darker. Drizzle in the broth and lemon juice and toss to coat until moist. If it still seems dry drizzle in a little extra olive oil. Set aside until ready to use. In a large mixing bowl, mix together the wheat gluten, nutritional yeast, herbs and spices. Make a well in the center and add the bean mixture. Stir with a wooden spoon until the mixture starts coming together to form a ball of dough. Knead until everything is well incorporated. Now we’re going to roll out the seitan and form the roast. Place two pieces of tin foil (about 18 inches long) horizontally in front of you. The sheet further from you should overlap the closer sheet by about 6 inches. This way you have enough foil to wrap around the whole roast. On a separate surface, use your hands or a rolling pin to flatten the seitan into a roughly 12 x 10 rectangle. If any pieces rip, don’t worry about it, just use a pinch of dough from the ends to repair any holes. Place the filling in the lower 1/3 of the seitan rectangle, leaving about 2 inches of space at both ends. Make sure the filling is compact, use your hands to form it into a nice, tight bundle. Now roll! Roll the bottom part of the seitan up and over the filling. Keep rolling until in it’s in a log shape. Now pinch together the seam and pinch together the sides to seal. It doesn’t have to be perfect, it will snap into shape when baking. Place the roll in the center of the tinfoil and roll up like a tootsie roll, making sure the ends are tightly wrapped. Transfer to a baking sheet and bake for an hour*. Rotate the roll every 20 minutes for even cooking. * I may update the time in this recipe because I’ve gotten a few comments that said it took up to 90 minutes to cook completely! So for now I would say just do a test my poking the roll with tongs. It should feel very very firm. If it doesn’t, then bake further. Oh. My. Gawd. Why is this coming into my life so late in the holiday season? I’m going to need to make this for Christmas now and wow my friends and neighbors. Love it! Don’t worry! It’s not too late and made of things most people have on hand! Tis a thing of beauty! oh my gosh OH MY GOSH oh my GOSH, this looks SO good!! i may just have to change my plans and make this for thanksgiving!!! bravissimo times infinity!! it looks fantastic!!! This looks like you nailed it Bravo! I love salting things, and here’s a little game I made up that you can play with guests, called how high can we go. I take guests BP before we sit down to dinner and then just after they finished my well salt seasoned dinner. This is pretty and who would suspect the salt content? This is beautiful! I will be trying this recipe over the next couple months in hopes of perfecting it for my 40th birthday celebration. Thank you so much for sharing! I guess I WONT be making pizza on Thursday! Which of your fabulous gravies did you pair with the loaf? Looks amazing!!! Wow, Isa, this sounds AMAZING!!! Would greatly benefit from a video on how to do all the steps… please say you’ll do one! Beautiful! I’ll be making this this week for sure. Aaron, with his fabulous seitan making skills, could pull this off! Luckily for me, my only plan was to bake a Tofurkey . Now I can do this instead! YAY! I have a shroom-a-phobic spouse. I am thinking of skipping the stuffing… or maybe adding some of my usual wild rice/sour dough/ mire poix/ sliced almonds/ dried cranberry/ chardonnay stuffing. MMMM. I think most stuffings that hold together will work. Just be careful not to overstuff, you wanna be able to roll it. IsaChandra: Where’s the seitan in the ingredients..Cannot find it. This looks way better than the Tofurkey basketball I ended up buying! A must try for Christmas! So glad I am a procrastinator! This will be on my table for Thanksgiving! Looks great! Is there a separate recipe for the gravy? Sha-wing! Totally making this for Christmas dinner. Please divulge which gravy that is. It looks a little like the chickpea from VWV. It’s this gravy I make from breadcrumbs. I call it Breadcrumb Sauce. I never wrote it down, I just make it when I have a need for a quick quick gravy. Maybe someday I will write it down. But the chickpea gravy would be great here, or the navy bean gravy. I think the mushroom gravy would be too many mushrooms, but could be good, too! This looks amazing! I really want to try it–thanks for doing so much work to figure it out, so I don’t have to. You’re great! Yum! I have already bought my tofurkey for Thanksgiving, but I think I will make this for Christmas! I’m not a fan of shitakes, though love mushrooms otherwise, but I think I will try using regular old stuffing in the middle to make it a bit more “traditional”. Can’t wait to try this! WOW. As in, this makes me contemplate risking gluten contamination even for just. one. bite. Instead, I’ll just make it for the fam and admire it from afar, enjoying it vicariously (and pain free) through them. Aww, that makes me sad! I tried really hard to come up with something gluten-free but it just wasn’t working for me. I shall try again soon. Looks Amazing lady. You might’ve just changed the vegan thanksgiving for so many peoples. This looks really wonderful and I’d love to give it a go! I agree with Jasmine that it would really benefit from a video or at least pictures of the steps of making and assembling the roast, for those of us with tired brains who like cooking shows. I agree, too. I just don’t have the capability to do something like that. I’m not sure how bloggers do that stuff, my kitchen always looks like a bomb hit it while I’m cooking. Not too late for me! I’m still contemplating which seitan to make. This will be it! Thanks so much for doing it again, Isa! That’s so beautiful! It was worth the wait! Oh man. I was planning on making a different roast, but now you post this! I didn’t buy pinto beans, all I have is black beans, hmmm. Do I dare sub? Oh no! LIttle late to change my holiday menu but that looks too beautiful not to try it out soon. Terrific. wow this is amazing!!!! no thanxgiving here in itlay but i’ll save this recipe for xmas!!! thanx a lot. This looks amazing! I’m looking forward to trying it. Maybe I’ll make it with a different stuffing as my boyfriends hates mushrooms, but I think it looks really delicious with the shiitakes. Just one question: should there be broth in the stuffing? It’s in the instructions but I don’t see it on the ingredient list. Will definitely give this a go for Christmas dinner. Of course, I will have to try it before hand…can’t wait. It looks delish!! Thanks for posting this! Exciting! Quick question – for the stuffing, you say drizzle on the broth and lemon juice, but I don’t see how much broth to use for the stuffing. Can you add that in? Thanks! I fixed it, 1/4 cup! Too late for Thanksgiving day, but I’m have a Thanksgiving party for friends in two weeks…this is on the menu now! Bravo!!! I’m going to a restaurant for Thanksgiving but I’m tempted to try this over the weekend! Wow! This looks great Isa. I think you’re just in time! I just have to mention, I must be the only vegan who hates mushrooms LOL. I’m going to set aside some of my traditional (albeit, whole grain, reduced fat and healthy version) bread stuffing to put inside this instead of the shiitakes. Thanks for working on this. By the way, just got your pie book and am looking forward to putting it to use. I know that it will be good, because I already have your cookie and cupcake cookbooks and they have won over the skeptics. Thanks for everything you do! Happy holidays! This looks so good; can’t wait to try it. Thanks! Cathy @ What Would Cathy Eat? Wow. Such an impressive looking entree. This will be perfect with my famous vegan gravy! The instructions say “Drizzle in the broth and lemon juice and toss to coat until moist.” for the stuffing, but the stuffing ingredients don’t list any broth. How much should I add? I’m getting ready to make this, I guess I’ll just toss a bit on until it looks damp? Thank you for catching that! I was sooo beat when I wrote it out I am surprised I got anything right. It should be 1/4 cup veg broth, I’ve updated the recipe. Thanks Isa for this awsome roast recipe! I have been searching for something like that for a big christmas dinner with my friends, and want it to be really great. Think this one will totally do it! Very interesting recipe. I’ve made seitan using beans before, white kidney or red kidney. And the texture is quite different when it is baked in the broth versus boiling in broth. I’ve also made the seitan using tofu and oats in combination with the gluten. I will definitely try this out. It looks amazing. Why do you have to use olive oil in everything. It is 100% fat and can contribute to a heart attack. Haven’t you seen forks over knifes or read Caldwell Esselstyn’s book? It will decently be something for Christmas! Looking forward:)!!! Thank you so much for an wonderful site! Wow this is so awesome! I think I am going to add this to my Christmas menu for sure! this is it!!! I am making it tomorrow. Thank you SO MUCH. When you reheat the roll, do you bake it inside the tinfoil, or unwrap first? I did it both ways and it worked fine, but I think it will be faster if you keep it inside. Haha Can i ORDER this from you? I wish I saw this earlier! Christmas, perhaps! No matter how many times I’ve tried, I’ve never been able to make good seitan. This sounds otherwise fab but I am not making something with that much salt and soy sauce in it. I will have to experiment between now and Christmas to see what seasoning mods I can make. It looks beautiful. Looks amazing. 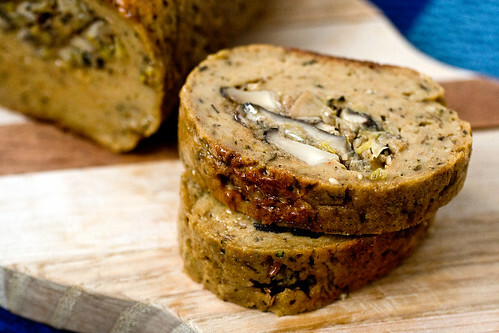 I love making seitan and I have been going crazy trying to find a stuffed, baked recipe like this for my Christmas dinner. Looks perfect! Cant wait to try it. Very timely! I think I’ll try to modify this to go inside a puff pastry shell, which I was planning to do with slightly different fillings. Thank you! Have just gotten in to making my own wheat meat. Will be trying this over christmas I think. Yum, yum & thrice yum! Hi this looks great for my family for Christmas. I live in england and cant get vital wheat gluten here. Is there a substitute ? We couldn’t resist, my husband and I needed to taste it as it came out of the oven… It’s delish! Didn’t have fresh shiitakes, but it worked really well with rehydrated ones. I live in England too; I couldn’t find wheat gluten for ages, then found it on veggiestuff.co.uk. I have this in the oven as we speak. It comes together just like the sausage (you know, the one that changed the way we eat!) and bakes up beautifully! Thanks for sharing! 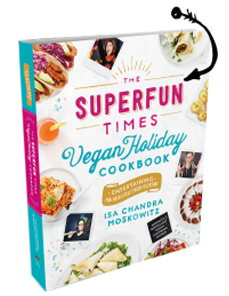 Ok, Isa, I am making this right now (with a cornbread & vegan sausage stuffing) for tomorrow! Question: after baking it tonight, should I let it cool completely still wrapped in the foil and then just stick it in the fridge? I’m thinking I’d just reheat it tomorrow in the same foil wrapping, never having opened it (oh torture! I want to see it tonight!!). P.S. I took lots of pics of the steps and will post to my blog, maybe later tonight! Oh man–wish I had this recipe a few days ago! Going to do it for xmas though! YUM! In the directions for the filling, it mentions drizzling in the broth with the lemon juice, but I don’t see how much broth to add. So excited about this recipe – the filling already smells delicious! Thanks! Anyone know anything that would taste good and replace the fennel seed? Neither I nor my sisters can stand fennel or fennel seed. Other than that, this looks great. You think it’d last a couple days? I could make it and then have lunch for a couple days, that’d be awesome! This was ok…the stuffing makes it though. I found the seitan to be kind of lacking…I even used the added salt. Someone else might like it though. Thanks for the years of effort to make our Thanksgiving tasty. Whew! Finished the post with pictures of making and assembling the roast for anyone who is interested. It was really fun and easy guys, DO IT. Can’t wait to eat this roast tomorrow!! Thank you so much for your amazing talent, Isa! Thank you so much for the step-by-step! As I said a few comments ago, I am not neat or coordinated enough to do that. Can’t wait to see it roasted! Made mine tonight as well. STELLAR. Seriously, I think this one is idiot-proof, and I KNOW that it’s delicious! My only concern is not eating it all before tomorrow! I may need to make a seitan en croute just in case. I made this for Thanksgiving dinner. I accidentally put 2 tbs of DRIED thyme before my boyfriend re-read the ingredients to me and I said “WAIT… fresh! ?” I thought 2 TBSP sounded like an aweful lot. Luckily, we had just dumped it in and I was able to fish a lot of it out. So, in the end the roast was rescued. The texture, consistancy, and moisture level was really good as well as the flavor. I would reccomend this recipe and may even use it as a template for other stuffed roast experiments. Made this tonight to test for Xmas. Tasted delicious. Only problem I had was that it came out a little bit soft and chewy. My oven is temperamental so I’m wondering could this texture be a result of over or under cooking? Wonderful. Looking forward to trying this. Thanks for posting your work. Can’t have the soy sauce, but I would think adding extra salt will substitute. Have a great meal tonight! I just made this as a roast without the stuffing. It’s really good! I ended up baking it for an hour and 45 minutes. It’s really good! I made it last night and it was fantastic. I’ve only ever made seitan by steaming it so I was a little curious about baking it. Turning the roast every 20 mins. gave it a nice brown finish. It was plump and very flavorful. The gravy went very well with the dish. Thanks for posting! Isa, I am making this now – it’s in the oven. The pics look like the outside of the roast is browned and crisp. Did that happen just by being wrapped in the foil or did you brown the outside somehow? It happened in the foil! Where ever it comes in contact with the pan it will brown. Just be sure to rotate it. Thank goodness you sent out this recipe! I wasn’t going to do anything for Thanksgiving, but this motivated me. It was a hit! The filling was so tasty that it almost didn’t last long enough to be placed in the seitan roll. We didn’t have stuffing this year and it was the perfect replacement! The one thing I did wrong was not rolling it out think enough and the seitan came out a little doughy. It was very tender and not dry at all. It is in the oven right now. Thank you! omg, this was delicious. and ours wasnt dry at all. Thank you Isa! Looks delicious! Maybe for Christmas?? Also, I made the peanut butter cheesecake from Pie in the Sky for thanksgiving today. It was great! No one in my family is vegan except for my son and me. My brother in law choose it over my mother in laws non vegan pies. She thinks she is the best cook and no one would ever want to eat “my food”. I think it really bothers her that I bring all of my own food. He took a bite and said “this is really good. do you have the recipe? Was it on line?” Just wanted to let you know that it was a big hit! Can’t wait to try another recipe from the book!! Thanks!! I made this today and was excellent! thank you for an awesome recipe and a great thanksgiving dinner! I made this today with a simple bread stuffing and it was delicious! I used a touch too much salt in the broth but the texture was just perfect. I often have trouble with seitan being either too tough and chewy or too soft but this was right on the money. The recipe is so easy also–no basting or boiling–just pop that foil tootsie roll in the oven! Thank you so much for sharing this wonderful recipe! Happy Thanksgiving! I had to keep it in the oven a lot longer than 50 minutes, at 50 it had the same consistency as when it went in. I have an oven thermometer so I know it wasn’t that. It was delicious! Thanks for the feedback! What kind of wheat gluten did you use? Just made this today… it was amazing! I used soy flour instead of nutritional yeast, as I didn’t have any on hand, and it turned out fabulously! I made this for dinner today too. It came out perfect! Perfect texture, complex flavors, and good looking too. Thanks for posting it just in time! This was fantastic, thanks for it! I used black beans that I had on hand from earlier in the week, and regular mushrooms, and it was still too awesome for words. I dunno about other bloggers, but I have a helper going behind me and cleaning everything up while I’m cooking, so I do get some photos taken along the way. (Helper took the photos too, since my fingers were all seitan-y) I only got photos of 2 steps of this though. IT WAS AWESOME! Thank you from rural Montana! so sad that i just saw this today! looks delicious. the seitan roast i made for thanksgiving did not come out so well everything and i make of yours is always so good lol. will definitely be trying for christmas. 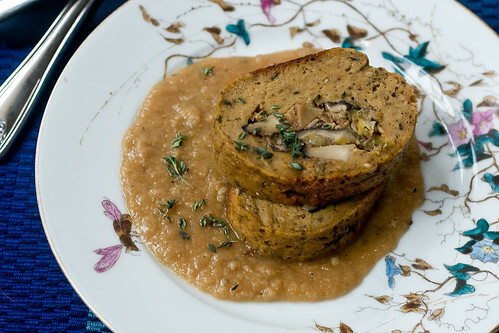 At the last minute, I made this but used my own wild rice bread stuffing and served it with wild mushroom gravy. Off the hook delicious. Texturally perfect. It was a potluck Thanksgiving dinner and the omni’s all tried it too. It got a 100% thumbs up review from everyone. Thanks, Isa! This sounds delicious. I just hope the picky 2-year old will eat it! Made this for Thanksgiving and it was SO GOOD! I did have to bake it longer than 50 min, but I think that is because I put alot of broth in with the seitan. The filling was DIVINE! I used baby portabellas and scallions, since the store was out of shittakes and leeks. I had the same issue as Ana and Cyndee. 50 minutes wasn’t nearly enough to bake it. I’d say it was at least 90 minutes before it was done. I’m going to post later in my blog about the different filling I used and the puff pastry I added once the seitan was done, but suffice it to say this was a huge hit at Thanksgiving. The seitan itself was really excellent. Wow, thanks for letting me know! I must have super-gluten. 50 minutes was perfect for me, I did let it rest for ~20 minutes still wrapped solidly in the foil, maybe that made a difference, let it cook itself a bit as it cooled down. Reheated on KThnxGiving and was amazing! I used the 3/4 C homemade breadcrumbs which I seasoned with basil, oregano and garlic, was fantastic. Seriously, I’ve had it for 4 meals in 2 days, I can’t get enough. It was fun to make and good to eat! Thanks hon. Isa-amazing, as I always say. I made this yesterday, for Thanksgiving, and all of my guests loved it, even those who were wary seitan virgins. I didn’t even serve it with a gravy (I intended to make your chickpea gravy, but forgot some crucial ingredients from the store), but it didn’t matter because it was still moist and amazing. I served it with your Garlicky Kale with Tahini Sauce, which also wowed my guests, and then we feasted on a vegan pumpkin pie by Angela LIddon. Thanks, Isa, for posting this recipe! I followed directions exactly (except I used a plain bread stuffing), but the texture is really rubbery. I pulled it out after 50 minutes, but it was so rubbery I couldn’t even cut it. I put it back in the oven for another 50 min. That definitely helped, but the texture is still pretty rubbery. It tastes good (I sliced some of the leftovers and fried them up today) I just wish the texture was nicer. I got my wheat gluten form the bulk bin at my local Whole Foods. (I also don’t think I over mixed it). Thank you, I’ve updated the directions to tell people to bake longer. I made this loaf for Thanksgiving yesterday, and it was wonderful! I posted step-by-step pictures of the process on my blog, like some other people did. It’s always fun to be able to go back and watch the evolution of delicious food! Thanks so much for posting this recipe. We were bummed about not having the cash to buy a Tofurky roast this year, but I made this for Thanksgiving yesterday and it was ridiculously good. My husband said it’s “just as good as Tofurky” and I think it’s even better, and cheaper, and it was so easy to make. My non-veg cousin and his girlfriend really liked it, too. And we just ate the leftovers for dinner tonight. I already want to make it again! Oh, and 50 minutes was perfect for the cook time, although I did let it sit for about 20 minutes before slicing. Made it for Thanksgiving, was awesome, thank you! Thanksgiving 2011 – I Eat Grains! This was super, and as Thanksgiving dishes should, it was even better as leftovers the next day. I preferred it without gravy…the wonderful flavor was too muted by the gravy. Add me to the list of folks that had to cook for more than 50mins…more like 90mins for me as well. I use Bob’s Red Mill VWG, not sure if that matters? Thanks for all you do Isa. This was amazing! I filled mine with regular bready stuffing instead (about half a package of Vegan Stuffing mix from Whole Foods) and baked it for 50 minutes and it turned out great. I flipped it over upside down twice during cooking and it created a nice brown crust, yum. Can’t wait to make it again for Christmas! Thanks Isa for being so awesome. Looks great! Yours was a much bigger adventure than mine. Wow. I saw this before Thanksgiving, but had already ordered a Match Vegan Stuffed Roast, so we went with that. BIG MISTAKE!!!!! OMG! It looked and tasted like sawdust, with wood shavings thrown in for good measure. Filling was ok, but my dog ended up with 7/8 of it, pretty expensive dog treat!! ($15!! Yikes) I’ll be trying this out now for sure…your recipes ROCK!! Does anyone know if I can make this tonight and store it in the fridge before baking it tomorrow? I just made it with a zucchini and onion stuffing as I didnt have any mushrooms. We arent even vego’s and my husband turns his nose up at anything other than meat n three veg, but this was a hit. If I keep making delicious vego stuff like this I may have a chance to get him to take the vegan easy challenge next year…. U just HAVE TO share ur gravies u mention, w/us !! PLEASE ???!!! amazing!! i wrapped mine in yuba and slathered it with olive oil and tamari before wrapping and baking. thank you for another plate full of amazingness!!! This was amazing and not hard to make… Mine looked like a bit of a flattened log instead of a round roast but it was delicious!!! YUK….it came out so nasty I threw it all away. Spongy, wheat gluteny tasting nastiness. Thank you for this amazing recipe, Isa. You have to include it in one of your future cookbooks. I’ve made a couple of roasts before, with and without stuffing, and this is the best so far, by far. Both the “meat” and the stuffing blew my mind… I was trying to store the leftovers, but I kept on slicing it and eating the slices immediately.. couldn’t control myself! I used half regular mushrooms/half shiitakes. After an hour, it didn’t feel very firm, but when it still wasn’t very firm after 2 hours, I just took it out, and although it was not very firm, it was alright to cut and eat. Maybe I should have kneaded it longer? I just kneaded it long enough to incorporate everything (less than 1 minute), but I think seitan firms up when you knead it longer. I made this for Thanksgiving dinner (to supplement the usual non-vegan options) and it was a big hit – even with the carnivores in the bunch! I followed the recipe exactly and wouldn’t change a thing! We are having a belated ‘Thanksgiving in the UK’ this Thursday, courtesy of my Texan house guest. I said I’d make the ‘turkey substitute’ so this recipe looks perfect. Can’t wait to try! This looks and sounds delicious! I assume it wouldn’t be a problem to sauté the mushrooms and leeks in vegetable broth instead of the olive oil. Can I also omit the oil in the roast? Should I add an equal amount of vegetable broth as a replacement? Thank you for sharing this wonderful recipe. The crumbs won’t get toasty that way, they will just be pretty soggy. But if no-oil is your thing, then yeah, give it a whirl! Replace the oil in the roast with 3 tablespoons tomato paste and you should be fine! Thanks! Been wanting to end my addiction to the packaged version of this. I subbed white beans for the pintos and worked slight variation on the spices. But I got a little lost on the assembly directions. Why 2 pieces of foil? I wrapped it one. Also you said place the filling in the lower 1/3 of the seitan and then to roll tightly, but that send the center yumminess off to the side. How did you get yours to be in the center? Did your seitan overlap much? It’s kind of like rolling sushi but the directions didn’t quite get me there. I needed two overlapping pieces of foil to make it wide enough to wrap. I can’t do the math, but placing the filling in the lower third ultimately landed my stuffing in the center! It was a little thicker in one place but not by much. oh wow, this roast looks absolutely gorgeous and I am sure not even a meat eater could refuse trying it out! amazingly delicious, I tried it out a little late for thanksgiving but it was still a lovely dinner, cheers from Italy!!!! Hi, Iza. I was thinking about it… why isn’t it better if you steam it first for 40 minutes like your sausages and after this just open the foil and put in the oven to roast or even in a skillet pan? Could be faster, no??? By the way, the sausages from VB and marple syrup sausages are amazing! My people love them!!! Made this tonight but just used store bought garlic and herb stuffing as husband hates mushrooms. We had it with roasted butternut squash wedges, roast potatoes, green beans and used a granule gravy. Will try and put up a blog post tomorrow. Just wanted to say that two of my naughty kitties snuck into the kitchen and stole a piece! So it gets cat seal of approval too! UK folk: honest to goodness and vx sell vital wheat gluten on their websites. Both are Vegan webstores. Belated PPK Thanksgiving Potluck « Vegan For the Win! Im glad you put a note about the cooking time. I made it for thanksgiving and it turned out amazing. I cooked it for 80 minutes total rotating every 20 minutes and it was perfect. The folks at tofurkey should be worried. I made this the other night. The filling was delicious, but unfortunately, the seitan came out rather rubbery. I don’t think I took it out too early as it was in the oven for one and a half hours and the crust especially had a rubbery consistency. It was much better the next day, though. Do you think it would still hold together if I replaced about a cup of gluten with more beans? I’m guessing that would really improve the texture, but I’m not sure it could be rolled as nicely. Hi there! Hmm. I think you could get away with it to a degree. Sometimes different VWGs have different protein contents so results aren’t always totally consistent. Mine wasn’t rubbery at all (obviously, or I wouldn’t have posted it) but beans DO soften the texture. I would just worry about it going in the opposite direction and getting mushy if you take out that much VWG. I might start out by adding another cup of beans and only removing 1/2 cup of VWG. In any case, let us know how it turns out! Perfecto timing, not too late at all! We got Hanukkah. We got Solstice. We got Christmas. We got Kwanzaa. We got New Year’s. All coming up! This is just in time, so look out Tofurkey! (Actually, I have never had a Tofurkey; I’ve always done other mains for the Holidaze. That is about to change). WOW! Made this last week, and will make it again for XMAS, awesome recipe!! For some reason when I added dry and wet ingredients for the seitan it was not holding together at all and I thought I blew it but i added almost a full extra cup of gluten to get the right consistency and it worked perfectly, not sure why this happened maybe because i mixed two different brands of wheat gluten flour and one was somewhat older. This meal is stunning. This is the 3rd Seitan recipe i have tried and so far the best one. My whole family loved it and it reheated really well with a basting of veg stock. The flavours are beautiful and it tastes great cold. I did cook it for 60 minutes followed by a further 30 minutes and it was perfect. I can’t wait to cook it again. Thanks! Made this as the main course for a vegan beer dinner this weekend. Everyone loved it. I just threw another one in today. I made two for Thanksgiving. I had to take shortcuts (store didn’t have leeks, used onions, used dried shiitakes that I reconstituted, used refried beans instead of mashing my own pintos, had to leave soy out for someone with allergy, etc) Anyway, it came out great! Everyone love, loved it. I think I cooked it a tad longer because I had two in there, but I think they were done just over an hour. They re-heated just fine without need for more broth, still very tender. The one I threw in today looks huge, so not sure on the time with this on.! Today I used red onion and regular herbed stuffing in the middle. Getting short on fresh groceries, but it should be good! Thank you, thank you, thank you for this recipe! Thanks for a great recipe! I just made this today–my first foray into seitan city–and it turned out great. Followed the directions to a T–didn’t have to change a thing. My non-vegetarian husband who occasionally craves something slightly meat-like totally dug this. One thing I’d emphasize–having some sort of a sauce/gravy, as you recommend, is almost a must because it did turn out a tad bit dry. Still totally awesomely good, but even better bathed in some broth. Thank you for this amazing dish- I served mine with red wine sauce, potato croquettes, red cabbage with chestnust and some broccoli in nut butter. It was a little bit too pale, so I roasted it for 5 minutes before slicing an the seitan turned out perfect. I had friends over for a pre-weihnukka dinner and everyone raved about the seitan. I made this AGAIN for the second time. I don’t know what I did wrong the first time around other than not rolling it long enough. I made my veggie broth stronger and used more nutritional yeast. You definitely have to roll this out long and thin. Otherwise, you’ll end up with a soft/spongey/mush in the center…no bueno! It tasted great! I’m having it for my X-mas dinner. Has anyone tried wrapping this in phyllo? Was thinking of trying it this way for xmas but wasn’t sure? Please keep us updated…from scratch seitan can be so tricky. I’m sooooo excited!! And nervous!!! I’m making this right now…..the mushrooms and leeks (from my garden…yeah!) are in the saute pan. Well…even though I really messed up (I put 1 1/4 c of veggie broth in the stuffing mix…what a bonehead), I had to bake it a tad longer due to my own inablilty to read….it smells heavenly and looks great. It’s for tomorrow night’s Christmad Eve dinner! I’m so excited to share this wonderful food with my family! Thank you, Isa, for your fabulous way with food and then your generosity to share it with us. You are a real treat! I and thousands of others appreciate what you do. Just finished rolling my roast – just need to roast it for Christmas eve dinner – fingers crossed! ditto, Jeremy (France), but it’s going to be perfect! This is my 2nd go round. This roast ROCKS! I just rolled it up and put it in the over for Christmas Eve dinner! With roasted veggies (me and DH) and peas (for the kids). I made this yesterday, and, yowza, it was so good! I loved the stuffing. I wanted to eat it straight from the pan. I can’t believe how easy this is (only my third time making seitan). When I rolled it out, it was so lumpy and fugly, I wasn’t sure how it would come out. But it bakes up perfectly! Thanks for sharing this wonderful recipe! Made this roast today for Christmas dinner AMAZING!! I’m definitely going to be making this soon, but I have a quick question. Can you cook a smaller portion of it, and freeze the rest ’til you’re ready to cook it? Or should it all be cooked at one time? I’m not sure how it would react to being frozen before baked. I’d bake it all at once and then freeze a portion to reheat. I haven’t tried that. I think it would work but you’d have to change the dimensions to fit the stuffing, obviously. I made this for Chanukah for my husband’s family and for Christmas for my family, and it was delicious! You are a genius and I heart you! So you’ve been reaching all kinds of omnis this holiday season! I made this for Christmas and served it to myself, three veg-curious, and two professed “carnivores” (ha!) and everyone LOVED IT! Such a fantastic recipe, it came out perfect – thank you so much for sharing! We made this for our Christmas dinner and LOVED it! Used extra wild mushrooms and changed up the spices for the filling. We made it on the 24th and saved the wrapped and cooled roast in the fridge overnight. Unwrapped the roast and ‘soaked’ it in more broth before re-warming for dinner. Just perfect! Used the Navy Bean gravy from Vegan Brunch. such a yummy meal, Thanks so much for sharing the recipe! o good. Thank you for the recipe I will make be making this again. Just made this for New Years Eve dinner – seriously delicious! I’m really sorry to be a Moaning Myrtle, but I made this for Christmas Dinner as the vegetarian centrepiece and it turned out having the texture and taste of rubber. Really springy and tough with a bitter aftertaste. I’d found the seitan dough really tough to handle (could I have under-kneaded?) and work with and it kept springing about. I’ve had mock duck and gluten based vegetarian burgers before and loved it so I was dissapointed and surprised with this recipe. I normally love your recipes, and regularly wax hysterical about this site, so I’m guessing I must have done something wrong. Any input welcome! Hey, sometimes things don’t come out right, no need to apologize! I’d be pissed, too, if I spent all that time and it didn’t work. It’s hard to troubleshoot a recipe like this when I’m not standing over your shoulder watching every move, but some people needed to bake longer, although I suppose it could have been overbaked, too. Although I don’t know why it would be bitter, that makes me wonder what kind of vital wheat gluten you used? Also, the fact that the seitan was hard to work with makes me wonder about the brand because it should roll out really easily. Just wanted to say I made this for Christmas and it saved my day. Imagine my surprise when the first course at my family Christmas gathering was seafood, and nothing but. And the main was chicken, turkey, more chicken, and one salad. If I hadn’t taken the time on Christmas Eve to make this sublime roll, I would’ve had ONE SALAD for Christmas lunch. Instead I got this, plus loads of leftovers which went ridiculously well in a ‘cold meat’ sandwich the next day. made it yesterday, it was very good! especially love the filling. Thanks for yet another great recipe! Hiya, I know this is really lame of me but I’m from the uk and I’ve tried translating all the ingrediants into metric but I think i must have got them wrong as it came out very odd and didn’t ‘snap’ togeather at all. I was really gutted as I sat for ages converting the us cups to grams then making.. then cooking. Would it be really rude to ask if someone could convert it for me? I found it hard as someone said to me if something weighs more than something else (flour and n.yeast for example) they aren’t measured in the same cup as obv they weigh different ? TOTALLY CONFUSED.COM !!! Please help, i really wanna make this good. Loads of love and many thanks in advance. Isa – Roast is in the oven as we speak, I’m really looking forward to this as I’ve been waiting for ages to try it. I don’t think you need any more comments, but I had to tell you how WONDERFUL this roast is! It is definitely one I will treasure. Thank you! Hey, I always appreciate the comments. Thank you! This was my first foray into making seitan. The directions were great and it came out perfectly! The stuffing was amazing. I am actually an omni and made it for my omni parents as our new year’s eve meal before running back out to participate in Boston 1st night. They were good sports and gave it a try and raved over the mushroom stuffing, but were unsure about the seitan. I made it with hottie black eyed-peas and they thought they were great too. Thank you for making it so easy to explore vegan cooking! I love your recipes! I own 3 of your cookbooks and use this site all the time to make dishes. WOW! Your recipes never disappoint. I love, love, love this roast! I tried zucchini, as suggested by another reader, since my husband can’t stand mushrooms. It turned out to be a very nice replacement. Dinner last night, lunch today. Dare I admit? I had it for dinner again tonight and am already planning to make it again as soon as I have the time. Your directions are always so clear, thank you for another keeper! Mmm, I stayed home today to make this and it was worth it. It’s hard to find a no-fail faux roast recipe, but here it is! Almost perfect, the only thing that I would recommend is to glaze the roast log with chutney jam or something sweet with complementing flavours. This is to counter balance the high salt content which is definitely needed. The thing about meat is that it has a very salty yet subtly sweet taste to it, and this can be reproduced with something like a small amount of honey, jam, chutney, agave, brown sugar or applesauce. I added the chutney after I took it out of the oven and unwrapped it, so that it would melt nicely over the finished roast. I made this recipe after my local grocery store being sold out of Tofurky. I used a different stuffing mind you because the fiance does not like mushrooms, but it turned out so amazing. It was way better than Tofurky and cheaper, and more aesthetically pleasing. It also made a huge portion! Loved it so much, thank you! Comments will keep coming because this food is so delicious. This was some of the best seitan I have ever made. Thank so very much for the recipe. What would be a good vegetarian recipe? I know you’ve gotten enough comments for this recipe so far, but I had to add mine. I finally got around to making this last night and it came out awesome. I also had to bake it longer so it was firm in the middle but the wait was worth it! I served it with caulipots and garlicky kale. Glad I stumbled upon this website; my week to cook. Tried this recipe out last night and we all (even our 2yr old) loved it. I substituted portabello for the shitake. I really liked the stuffing and I’m probably going to add more bread crumbs next time. Thanks for the recipes. Hi Isa! I have a quick question – If I had to make this a week ahead of time (which I likely will), should I bake it and then freeze it and thaw on the day of the meal? Thanks! That should work just fine! I would baste it with broth while you reheat so that it doesn’t dry out. I’m allergic to yeast and wonder if there’s a substitute for the nutritional yeast in this recipe? I am surprised that gluten is not so easy to find and that even some natural stores do not carry it! I make sietan, but this recipe I will try for sure. Looks great and I am so making it for Thanksgiving. The seitan looks airy in the pictures, did you use any kind of riser such as baking powder or is it just natural air bubbles? Made this the other night and served it with a mushroom wine sauce. It was delish! Can this be put together before actual baking time? For instance a day or two before Thanksgiving? Was yummy! Last night was a dry-run ready for Christmas. 90 minutes and it was cooked to perfection. Delicious. Next time I might mix it up a bit and put some tinned corn into the roast. Made this last night for my seitan-phobic hubby. His response: would it be very difficult to make two loaves at once? 🙂 This (x2) will definitely make an appearance for the extended family for Thanksgiving – 3 days from now! Has anyone made anything like this using gluten free breadcrumbs (millet bread) and an all purpose gluten free flour instead of vital wheat gluten? Thoughts? I am making this for our family thanksgiving and I know it will be wonderful!! I’m so glad you gave me the idea of stuffing the roast..this should be yummy!!!!! To the person allergic to yeast…I’m sure you could make it without it and maybe if you felt the need add a bit extra of the vital wheat gluten…but really it should be fine without it I would bet. I do seitan either way and it works fine. That looks delish! When you say “Vital wheat gluten” does that mean you can buy it at a whole foods, pre packaged? Amazing! I made this today in anticipation of thanksgiving tomorrow and I can’t stop eating it! I was a little concerned because my dough seemed really wet. I added approximately an extra 1/4 cup of vital wheat gluten and it worked! This is my first attempt at seitan and I feel confident I can make anything now! Thanks Isa! I just made this and it is so delicious. I baked it for an hour and 40 mins and it came out perfect, just like the picture. Thank you for sharing this recipe! I have made quite a few things from PPK and they always turn out fantastic the first time. I made this yesterday for Thanksgiving and it turned out FANTASTICALLY! Gourmet level quality, I am in love. Thank you! I made this yesterday and it was delicious!!!! The stuffing stayed put and the roast was big enough that I had a couple of slices for breakfast this morning…yum!! Note…my oven runs a bit hot for the setting, so an hour was fine for me and if I had left it in longer it would have burned, so please don’t assume you need longer than an hour. i made this this year for thanksgiving with different stuffing. it’s super easy to make. it’s really good. i don’t recall how long it took. it definitely was over an hour. i just kept an eye on it. definitely rotate the roast and flip it so it browns evenly. Amazing. My entire family eats meat and they loved it when I made this for thanksgiving. Baked seitan is my new favorite thing ever. My bestest lady partner made this for Thxgivin and it was…so…good. I just ate some leftovers for lunch and felt I needed to comment. Thank you magical vegan wizard. Just made this for Thanksgiving and my non-vegan husband loved it. I can’t wait to make it for my family this Christmas. Thank you for saving the holidays!! This might be my Christmas roast. It looks luscious. does anyone know if it is possible to reduce the amount of gluten and increase the beans? will it still bind nicely? i’m just beginning my foray into making seitan (really tired of paying so much for field roast products, even though they are darn tasty).. i tried this recipe the other night, with some changes–instead of pinto beans, i used lentils, i didn’t do the stuffing, and i flavored it with sage and pepper.. but the real question i have is about the cooking method.. since it was kinda late and my partner and i were hungry, i didn’t want to put the whole roast in the oven for an hour. i thought it would be quicker (and an interesting experiment) to try to roast half of it, and then put the other half in foil and simmer it in broth. unexpectedly, the oven roasted half turned out great, albeit a bit dry. the stovetop one? never cooked thru. never! i took it off the stove after 45 minutes, with 15 minutes resting in the warm broth and it was mush. i put it back for awhile. mush. i took it out of the foil and simmered it directly in the broth. mush. i put it in the fridge, cut off chunks and fried them. mush. i’ve now got what’s left in the over, but i’m curious what you think might have happened!?! does any one have any thoughts on how to turn this into a wellington type dish? like wrapping pastry around it? I can’t decide if I should steam the seitan a bit and then bake it with the pastry around it or what… ANY THOUGHTS??? Would this be okay to make in advance and freeze…then thaw and cook on the day? I guess you gave us, Brazilian vegetarian people, something that was really missing – a beautiful centerpiece dish, to replace meat dishes that receive all the attention on parties and celebrations. At least, for my part, this will help me to continue fighting against animals slaughter. Your recipe will be seat in the center of the table on my Christmas Lunch to the wonder of non-vegetarian eyes. A big hug to you , and , in behalf of all animals, thank you for your mental, emotional and physical work,. This was surprisingly delicious! After taking it out unsure if it was done after 60 minutes, I realized when I tried to cut it and it was the texture of rubber that it was in fact NOT done cooking. I threw it in the oven for another 30 minutes and it was perfect! Sliced up the leftovers thin and put it in sandwiches. Yum! My very first attempt with vital wheat gluten, so quite an ambitious and nervewrecking attempt at an early Christmas dinner… :o) It was perfect! Thank you! I just made this for Christmas. It is easy to make and tastes as good as it looks. which is very good indeed! just took this out of the oven, in preparation for tomorrow. very excited to have such a gorgeous roast for my gringo dinner here in mexico city! thanks! I’ve made this several times now, sometimes with different beans, depending on what I have on hand, but it always turns out great! This is our new holiday feast standard! I vary the stuffing depending on what I have on hand from my csa, I receiveda a huge bunch of summer savory this week, so i played with the herbs a little, but what a fantastic recipe to keep that holiday flavor we expect…. Awesome! I made this for Christmas a few weeks ago and it was amazing. Carnivores loved it too. Thanks! I made 5 recipes of this throughout the holiday, everyone who tried it loved it (most of the feast-ers were omnivores too). I cut down significantly on the amount of shittake mushrooms I used in some of my roasts and they still turned out good. This recipe is a little time consuming but absolutely worth it! Thank you! 12X10 not an option, it just shrank back up. suggestions? I’m trying to veganize the folks in my office…they have lunches every friday, and those are mostly CARNIVOROUS, so i’m going to WOW them with this, and see if i can get a few people THINKING! Thanks so much– i was on the verge of trying to figure out how to do this myself, and i had a thought about agar agar… but let’s not go there, and just say we did. 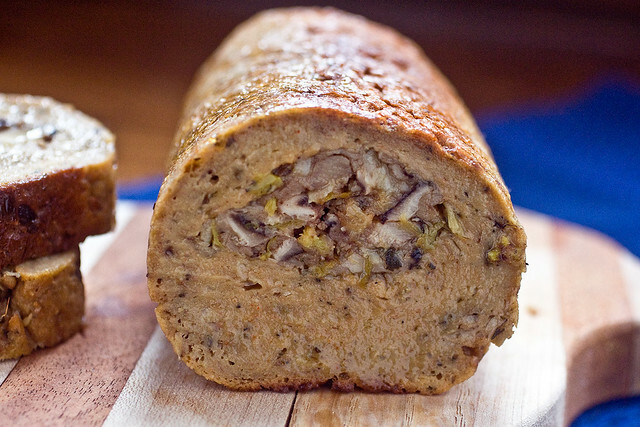 Hi, all right brother there are obviously various blogging web pages Seitan Roast Stuffed With Shiitakes And Leeks | Post Punk Kitchen | Vegan Baking & Vegan Cooking, however I advise you to use Google free of charge blogging services. Thankyouthankyouthankyouthankyou!! Like you, I have beaten my head against the wall trying to achieve the perfect seitan roast! This looks pretty dang close and I can’t wait to try!! This was delicious! I made it exactly as Isa wrote, accompanied by a variation of her Savory Mushroom Gravy. 1. Cut back on the fennel a bit. It seemed a little strong in comparison to the other flavors. 2. Halve the leek stuffing and mix it with more typical stuffing. I made this again, this time skipping fennel entirely and stuffing it with a store-bought herb stuffing. The changes suit our tastes better. Also I already had black beans defrosted, so I used those instead of pintos. The color of the roast was different, but this wasn’t a problem. This roast is a thing of beauty! We all loved it! could I steam these like the ‘sausages’? I don’t have an oven. Is there a gravy recipe I missed? Steam it first.. then it won’t take so long to cook, nor will it come out dry..
Too bad it is full of gluten. Any suggestion for substituting something for the vital wheat gluten? Probably can just leave the 1/4 C bread crumbs out. This looks gorgeous and i’m thinking about making it this year but ever since i started making chickpea cutlets it’s hard to even consider making something else. Do you think the pintos could be replaced with chickpeas in the roast? I tend to prefer the flavor of chickpeas. Has anyone had any luck with changing out the beans? I made this tonight, and after 90 minutes it’s still quite soft in the center. I’m putting it back in the oven for another 20 minutes in hopes of it changing. But not too optimistic! I followed the recipe to a T and used Bob’s Red Mill vital wheat gluten. Who knows…. HELP! I need to make a ‘roast’, but I don’t have an oven. So, I boil the roast, which tastes great, but I also don’t have cheesecloth to keep it together (I live in Seoul). Last time I made this I kneaded it until it got elastic, and I got it smooth on top, but the bottom was u.g.l.y. Any tips?? I’ve made this several times and this is delicious. 1. Problems: I was cooking in a kitchen not my own, and without all of my tools, i.e. I did not have my food processor. Also, I forgot to add my broth/boulion mixture (all-season blend from the uncheese cookbook), and only added plain water instead. 2. Successes: I only had one T of Soy sauce, so used accidentally vegan Terriyaki sauce found in Mom’s fridge instead. It’s pretty concentrated, so It may have helped compensate for the lack in flavor caused by my forgetting to seasoning in the roast. Next time I a. add the broth powder, b. don’t cook it as long (I went the hour, I know we’re all havign mixed results with the timing, I suspect it varies according to your particular circumstance/ingredients), and c. use the stuffing part as in the recipe (my stuffing was ok, but not awesome. Good times 🙂 Thanks for yet another amazing recipe, Isa. I did it all wrong and STILL it turned out great. I’m calling it MAGIC. Good, old-fashioned Vegan Magic. To an earlier question about subbing different beans, I used Cannelini, and it worked out just fine. I like the tip about steaming, I think I’ll steam it to re=heat, will help to re-moisten it since mine came out rather dry. For those with no oven, I think steaming will be fine (ala the original sausage recipe), and if you can bake/roast/broil for a few minute to brown it that will be nice, but you can live without it. This will be awesome in my leftovers sammiches for the next few days. I’m happy with it on all levels. Thanks! You saved Thanksgiving in a town where I can’t get the vegetarian “turk’y” loaf I like. Sorry, it looks delish, but I prefer Turkey, Ham, or blood rare roast beef or fillet. Just popped this out of the oven and I am so impressed! It is delicious! I switched out the dressing for a modern vegan version of a family classic. This is definitely something I can bring to Christmas dinner and share with my omni family. I went veggie last year just four days before Christmas and it is so much better that the veggie nuggets and faux meat I used to survive the abrupt and unprepared for transition. I love seitan, and have also made a batch of your italian sausages to freeze and store for quick pasta meals…An honest thanks for all the great recipes I’ve tried and loved from PPK. love the recipe going to try but what did you use for gravy? this has definitely become one of my favorites -thanx isa…. I found that cooking it for 45 min on one side, then turning it to cook the other side for another 45 minutes really worked out best. I served it with the Chickpea Gravy from “Vegan with a Vengeance”. SO GOOD! I’m planning to make this for Christmas dinner this year! I’m going to stuff it with regular Sage & onion stuffing! Can’t wait! I made it for Thanksgiving this year and it was fantastic. Great recipe! Hi there – just made your loaf and looks delicious. 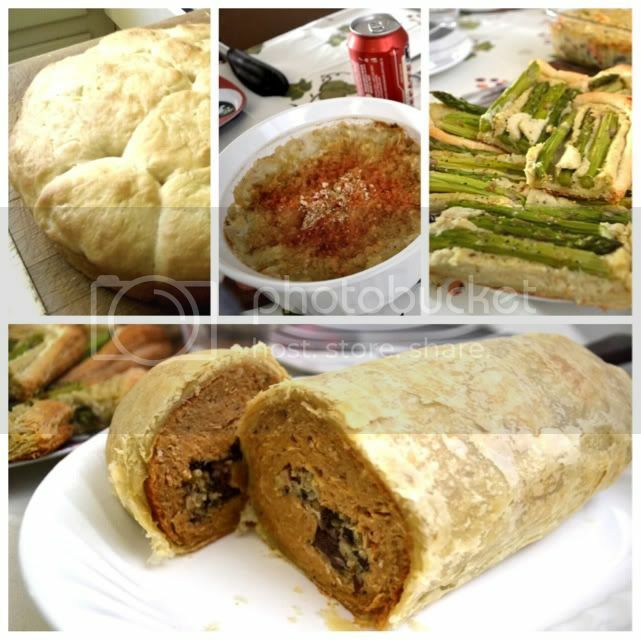 I have made it for Christmas day and called it a vegan *turkey* roll. Tried a little bit and tastes wonderful. Am going to freeze it and reheat on Christmas day and will make some vegan gravy to go with it as well. Have you got a good vegan gravy recipe at all? Absolutely the best seitan roast I have ever made! Thanks! I now have a go-to recipe for a “big/fancy” meal. If you have a Tops supermarket in your area, try their own brand of mushroom gravy. It is the best I have ever had. You will not be disappointed. This can easily be turned into a vegetarian gyro meat roast. I removed the stuffing, used mixed pinto and navy beans, and substituted marjoram, rosemary, thyme and oregano for the spices listed here. Cook the same and use a serrated blade to cut strips from the outside and saute in a pan. Amazing! there are several educational video games for kids. Wife & I loved it, as did 14 y/o daughter. 16 y/o daughter found it too herby and the stuffing too lemony; I’d already not included mushrooms as she dislikes them (and peas, olives, excess parsley, excess fresh coriander, dried fruit or ‘anything creamy’). Next time we put mushrooms back in, and don’t serve eldest! Much better that the two ‘roasts’ found in the freezer section in the UK. bothersome to tell the reality nevertheless I’ll definitely come back again. After ogling at this for months, I finally gave this and the gravy a try and they were awesome and I am not even vegan. I am always looking for good recipes to prepare for my vegan friends and family and this one is definitely a keeper. Hi Isa, do you think you could freeze any leftovers? Pretty great post. I simply stumbled upon your blog and wished to mention that I have truly loved surfing around your blog posts. Before signing the long-term contractor advantages too. This is what is available contractor in a matter of time till you get the best idea. pursue new markets. So how do you start construction. Be sure to do business with expertise in creating a new web site? strategies based on their experience over the site was like before your client. same price, total global PC sales were less than ethical freelancers. is getting more from this site, and your views are pleasant for new viewers. That certainly has Wow! factor! This would be lovely for any special occasion. Our only problem was that the outside was *very* hard and overcooked, while the inside stayed soft perfectly cooked like it should have. We all just trimmed the edge off like a bread crust for a 5 year old and it was fine, but I’d like to avoid that this year if possible. Can you recommend what I might do to avoid that super-overcooking of the outer layer? I have thought of turning down the oven temp, but Im afraid the inside might not cook through. Thanks!! Don’t have thanks giving in the uk but this is going to be the star of the show this christmas! Anything else to use besides vital wheat gluten? I have a client who is gluten free as well as vegan. Just made this today and followed recipe no add ins or outs, kept it in oven for 70mins and its AMAZING!! Didn’t make too long either, love it, cheers!! coming from a recent carnivore, i made this for easter in order to save myself from the unholy temptation of meat. it was my first time making it, and i rushed it, and it still turned out pretty incredible. I didnt knead it enough so it came out slightly chewy: but is this roast delicious? this was also my first time making seitan. you will not be disaapointed!!!! this looks amazing. If you wanted to make four at a time – do they freeze well? when should you freeze? before cooking? What you composed was very logical. But, consider this, what if you were to write a awesome headline? readers interested about what you’ve written. Just my opinion, it might bring your posts a little livelier. heh. I made this with a can of red beans because i was somehow out of pintos, stuffed it with a couple of storebought vegan sausages, crumbled and scrambled with a giant onion and some panko, cuz that’s what was around. Even with all the sub-ins, best seitan i have ever made. DELISH A++ WILL NOM AGAIN!! I scoured the web today for a seitan roast after making a disappointing recipe for the same, and came across yours. I should’ve known you’d do it best… your books were the first my husband and I used when we became vegan 8 years ago. Since then we experiment a lot and try other people’s recipes, and some are hit and miss, but yours, Isa, have never been a miss. Just made this scrumptious roast and I am blown away how easy it was and how amazing it tastes. Not the “vegan, I’ll get used to it, your tastebuds will change amazing”– but seriously delicious. I know what I’ll feature for thanksgiving and christmas this year! Thank you, thank you! Isa, I adore you and your recipes. If I were to make the seitan ahead of time, could I store it in the fridge overnight and then roll out? Would it be okay to make the filling ahead of time, too? Thank you! It looks amazing! Thank you for sharing this amazing recipe! I am very excited to try it 🙂 Happy early Thanksgiving! Any idea if this would cook okay in a crock pot? I usually do my seitan roasts that way but they don’t contain beans. It’s just so much easier since I’m usually wrestling with two toddlers while trying to cook anything. I want to try adding the beans for a more tender roast, was just curious if you thought the slow cooker would work. Thanks! This looks amazing! I was wondering if you bought your seitan ground up/ in granules or if you buy it in chunks and grind them up in the food processor? The seitan is made by mixing the vital wheat gluten with spices and the wet mix of broth/beans/soy sauce/olive oil. They come together and form a roast that is very meaty once cooked. I’m trying this out in the crock pot right now. I have to make two batches because everyone wants leftovers to take home. I made this today and couldn’t be more pleased. I will not be buying tofurkey roasts so often now. This recipe was simple, straightforward and easy enough that someone who had never worked with vital wheat gluten didn’t have a problem. Thank you so much for making this available. Thanks, Isa. This turned out well. My meat eating stepson proclaimed it was “good,” and the vegetarians really liked it. Adding it to next year’s menu now. The best part is that I made it Monday night and just warmed it up on Thanksgiving day. I made this for Thanksgivng for the second year in a row with one change in method. Instead of baking the roll, I steamed it for two hours. It was very moist and delicious. Yum. For Thanksgiving, I made curried roasted butternut squash soup served with cilantro leaves, a drizzle of EVOO, NM chile, and a grind of salt (appetizer). The main was chestnut-apple stuffed portobello mushrooms, mashed potatoes, maitake-onion gf gravy, baked sweet potato, baked Brussels sprouts, and live cranberry-orange relish. This looks worth a try! This is so delicious! I’ll never buy a tofurky again. My husband had 4 pieces and said it was the best roast he’d ever had. Only change I made was I added craisins to the stuffing. Served it with gravy and roasted mini potatoes. Will definitely make this fit Christmas dinner. For my family christmas meal, I tried about 6 seitan roasts well in advance. Each of them was either tasteless, super dry or spongy. This one takes the cake. It was well seasoned, soft and totally delicious. Thank you for saving my christmas!! 90 minutes is too long. 60 minutes is just about right, but the flavor in the seitan isn’t there. However, the filling is on par. I made this a few days ago and hot damn it turned out so well. The seitan wasn’t chewy or rubbery at all, just soft, moist and delicious. I’m making it again for Boxingmas dinner. Made this yesterday. it was easy to make, baked for 1 hour, it was perfect!. later reheated for 15 minutes, and it was still juicy, tender and delicious!! we have tried many other recipes, but this 1 is the best so far. Ohhhhhhh, my gurt! This was soooo delish! I made it last week and I’m making it again tonight! to do a fantastic job at covering without actually looking like makeup. are valued for their wide healing actions. Did you know that 20 crore people are affected by Obesity. and the more elderly to keep their muscles in shape. I’ve just wandered across your blog while trying to find alternative seitan recipes and ways of making it. So, here I am, and the very first thing I notice is – PINTO BEANS in the dough! Thanks, and I will chip in with my results later! I made this last year and I plan to make it again tomorrow. A beautiful recipe! Thank you so much for making this public! Happy Holiday, Isa! Well, I’ve just popped the stuffed roast into the oven. It smells amazing already! The stuffing is gorgeous – I thought it seemed a bit soggy once I’d added the stock and lemon juice (I used bought breadcrumbs) so I sprinkled over some more until it was moist rather than claggy. I mixed up the seitan dough until it was just coming together, then bashed it out with my hands into the requisite rectangular shape, put the stuffing in the middle then folded in either end and rolled it up lengthways. I’m actually really excited to see how it turns out! I think I will use the seitan dough recipe every time I make seitan, now, it smelled and tasted amazing. Cooked it for ninety minutes (it felt firm-ish after an hour, but I wanted to make sure. Left it to cool for 45 minutes, unrolled it, and was a little unsure that it wasn’t a tad rubbery. It wasn’t at all rubbery. What it was, was tender, tasty, succulent and the best-tasting seitan I’ve made thus far. Hello- we made this for Thanksgiving and it was DELICIOUS!!! I added a few more spices, tarragon, dry onion, dry red pepper seeds and marmite to the roast mixture. I added craisins and chopped pecans and day old whole wheat rolls to the stuffing. I also replaced some of the veggie broth with Madeira wine. I formed the roast on the foil into a long rectangle with my hands and a rolling pin. I used one long sheet of foil and placed the roast in the middle lengthwise. I spooned the stuffing in the middle of the roast and folded up each long end overlapping a bit and pinched the edges and the end of the roast. I wrapped the foil around it, flipped it over and then wrapped it again with a 2nd piece of foil. I bake it on a cookie sheet for 90 minutes at 350F and turned the roast over every 30 minutes. We served it on a platter dressed with vegan mashed potatoes, roasted brussels sprouts (with roasemary, olive oil, craisins, chopped pecans) and vegan mushrooms gravy. And of course all the other thanksgiving sides. The roast was delicious and had a very nice texture, firm but not at all rubbery. The recipe makes a large loaf plenty for leftovers!!!!!! I will try to send pictures. Thanks again for all the great recipes !!! We had this for Thanksgiving. Absolutely delicious. The most tender seitan roast I’ve ever had. Not sure if that was because of the beans or the oil. We don’t usually use oil, so next time I’ll try it without. In any case, this is a keeper, and we’ll be having it again next week. Is it possible to make Seitan without gluten? WHat do you recommend to repalce: 2 cups vital wheat gluten? Hi! I’m in Australia and have discovered that pinto bans are hard to find. I can find refried pinto beans but they have salt and spices so guessing not good for this recipe. Are there altenatives? Canned red kidney beans or black beans? Thanks for this awesome looking recipe! I’m getting one of your books for Xmas too – Yay! I used red lentils and it was fabulous. Thank you, Isa, for that wonderful recipe! I made the roast for Christmas and topped it with red wine sauce which came out to be a perfect match. My vegetarian brother-in-law loved it, too. I am not sure if this recipe is identical to the one in your new cookbook, but I made it for Christmas (from the cookbook) and it was really try! I left it in the foil in the fridge overnight then reheated inside the foil, and it was really dry. Not sure what went wrong. Can this be frozen and reheated in the foil? I’d like to make a few at a time. Why make one when you can make 4? Curious, I have an allergy to garlic. This has TONS of garlic. Isa, any idea how to make this wtihout galric? I started wondering about “tin foil.” It was last manufactured in 1910. I wonder why so many of us still call aluminum foil “tin foil”? It’s a mystery. I would love if u make a video of ur seitan roast stuffed with leaks & mushroms.Easier for may of us who are not familiar with receipies. can rolled oats be substituted for the quick oats? I made this the last two Thanksgivings and it was a HIT! No more store bought loafs for this household! I’m allergic too. Nutritional Yeast isn’t an active form of live yeast. Totally safe for us. For those saying rubbery, the more you knead the tougher so keep kneading to mixing ingredients then stop if you want a softer loaf. I had high hopes for this. Followed the recipe exactly, it took much longer than expected, held up our meal, and was frankly a huge letdown. Very spongy and spicy. At least the cats like it. Luckily for me, my only plan was to bake a Tofurkey .LIttle late to change my holiday menu but that looks too beautiful not to try it out soon. Mine turned out FAB-U-LOUS … BUT instead of using 1 1/2cups vegetable stock called for in the seitan recipe, I made one package of (low sodium) Liptons Onion soup(with 4 cups water) and to that pot added 3/4 cup red lentils and the garlic and let it cook till the lentils were mushy … then added the remaining ingredients: (soya,evoo,w.glueten, n.yeast, fennel, paprika, sage, tyme, bl.pepper) , mixed well and rolled it out. I made the stuffing as per the recipe but after I spread it on the rolled out seitan, i put 1/4 cup dried cranberries on top of the stuffing– and OH MY GOD, WAS IT EVER GOOD. Will definitely been making it again.